Our 409 Grade Stainless De-CAT pipes are made from 409 grade stainless steel and have mild steel mounting flanges. Allows improved exhaust gas flow and improved exhaust note. They are stamped and have a 10 year guarantee. They are direct replacements for the standard Land Rover part. 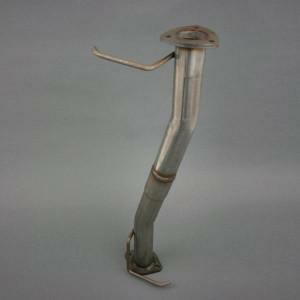 AlliSport Centre Silencer Removal pipes do not affect your vehicles MOT test or emissions.